These Korean oven-roasted barbecue chicken wings, known as tong dak or tongdak, are good for almost any occasion. Korean barbecue tong dak chicken wings have grown substantially in popularity in Korea. These days, you can find them offered practically everywhere in South Korea, and the concept has been exported to the U.S. Tong dak is featured on menus from Baltimore to Chicago and San Francisco. Major South Korean restaurant chains such as Kyochon Chicken and Bonchon have opened locations in the United States, bringing their own versions of Korean barbecue chicken wings across the Pacific. These Korean tong dak chicken wings are juicy, spicy, and sweet, and it's impossible to just eat one. When choosing your fresh chicken wings and drumettes at the store, bear in mind that smaller wings (from younger chickens) are likely to be more tender, while larger ones will have more meat and may be juicier. 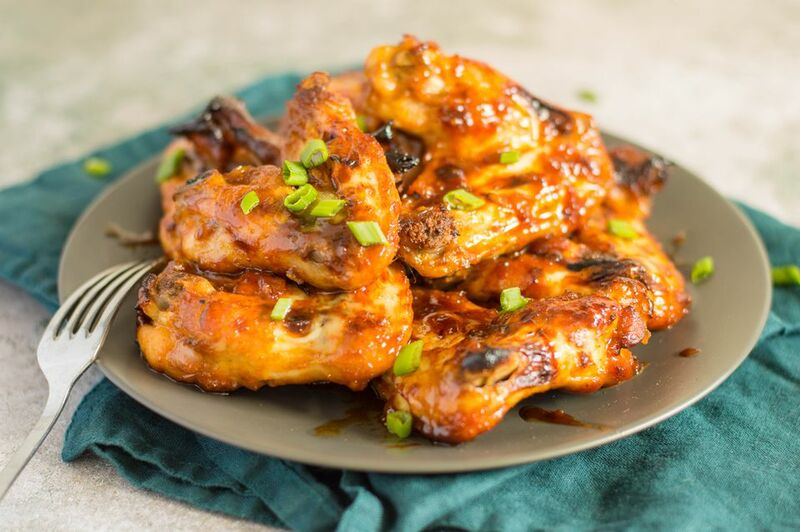 The key to this Korean barbecue chicken wings recipe is cooking the wings twice—once while browning them in a pan on the stove, and again while roasting them in the oven. If you want to boost the hot factor for these wings, add some extra kochujang—just be careful not to add too much. Mix all ingredients, except the chicken, together for the sauce. Marinate chicken for at least an hour in the sauce (a few hours is better). In a heated pan on the stove, brown the chicken on all sides, reserving the marinade for later. Transfer chicken wings and drumsticks to a shallow roasting pan, pouring sauce over pieces. Put chicken into the preheated oven and cook for a total of 40 to 50 minutes. Turn once during cooking, covering with more sauce if needed.